Shah Rukh Khan has made us fall in love with his on-screen romance, his evergreen charm, and his golden heart. But, what always stands out, is the superstar’s witty comments and subtle humour. From time and again, SRK has come around with his wordplay. 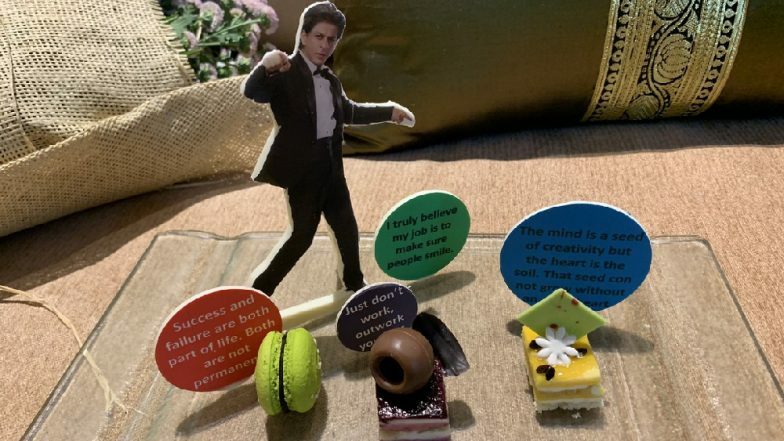 Earlier today, when a hotel in Kolkata greeted him with a plate full of pastries, customised for him, the Zero actor took to his Twitter handle to share the picture. However, what caught our attention was the witty caption written with it. Netflix: Shah Rukh Khan to Produce Class of ’83 While Lust Stories Directors Reunite for Horror Movie Ghost Stories. The Dilwale actor is busy encouraging his team Kolkata Knight Riders in the ongoing IPL. SRK recently grabbed headlines for his meeting with the Tamil director Atlee during an IPL match in Chennai. Reports soon rounded that the actor is eying a possible Hindi remake of the hit Tamil film Mersal. On the work front, SRK was last seen in Aanand L Rai’s Zero. The movie also starred Anushka Sharma and Katrina Kaif in lead roles. Despite the heavy promotions and much anticipation, the movie failed to impress the audiences and critics alike. There has been no official confirmation about Shah Rukh’s next project. However, as a producer, the superstar continues to profit. His latest film Badla, starring Amitabh Bachchan and Taapsee Pannu, did well at the box-office and was critically acclaimed.